It's been another incredible week for me, making new friends and solidifying relationships and collaborations. Sometimes I feel bad about how happy I am, my Year of Living Joyously, as I call it. You all are working so hard on all your endeavors. Most of you don't get this privilege that I enjoy: working for Mother Earth, full-time. I never lose touch with my gratitude about that. Nor does my concern for our children's future ever wane. Sorry, got distracted there. This IS the most amazing time to be alive, because it is the most challenging, ever. The global restoration movement is not only beginning, it's absolutely necessary. And we will do it with kindness, respect and love, because that is the only way. And what we sacrifice in the process, won't have been important anyway. Great meeting with the new executive director of Earth Day Indiana, Summer Keown. Summer is taking the position from Stephen Sellers, who did such a great job growing Earth Day Indiana into a massive annual festival of eco-awareness. Summer is poised to build on that legacy. Read more about her. Later that same day, I met Rachael and Martha Hoover, of Patachou fame. It was a delightful experience: I've known Martha since very earliest days of Patachou, and if you know Patachou, then you know what a success it has turned out to be, from the numerous Patachou restaurants to the spawn of Napolese. "Spawn of Napolese" -- sounds almost like a horror film! But it's not, Napolese is just one more amazing endeavor by the Hoovers that sources local food and does everything right to reduce carbon footprint and waste. Rachael, Martha's daughter, is helping steer the Napolese restaurants, that are poised to expand, nationally. Read about that here. Rachael and Martha met with me, not to discuss their restaurants but to discuss their effort to feed nutritious food to some of Indy's most underserved, food insecure kids, via the Patachou Foundation. I hope to help them in any way I can. I am working more and more in the food arena. My blog is filled with stories of kids wanting locally sourced foods, of kids trying to dispose of food waste responsibly, so maybe I can be of assistance to these amazing women and their efforts to feed kids good, nutritious food. The next day, I was at the launch of the Harmony-Meier Institute for Democracy and Equity in Education, a collaboration between the Harmony Education Center, IU's School of Education and Lilly Library, in partnership with Debbie Meier herself, a MacArthur Fellow who is an advocate for incorporating democracy, social justice and equity into American education. Steve "Roc" Bonchek, executive director and found of Harmony School in Bloomington. 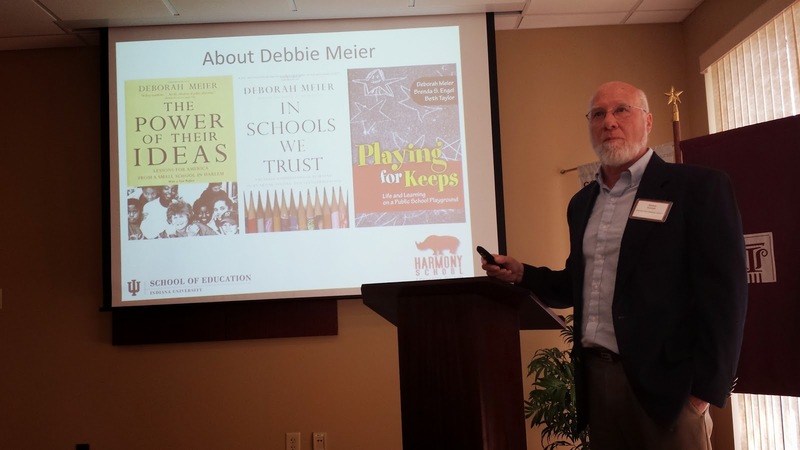 This collaboration will be housed at the new Inspire Living-Learning Center on the campus of IU Bloomington, where education students will explore the work of Debbie Meier and Harmony School, and champion their own efforts, philosophies and teaching styles. Much more on this later, my friends! 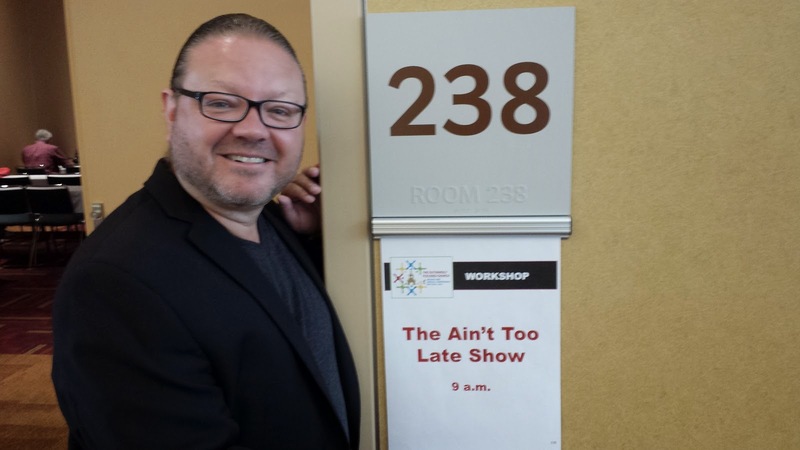 It was a fun week for The Ain't Too Late Show, too, as I got the whole crew together to do a gig at the Indiana United Methodist annual conference. The Methodists enjoy a fine tradition of social justice activism, so I knew I was singing to the choir, so to speak. One of the Ain't Too Late Show's powerhouse talents, Travis DiNicola. 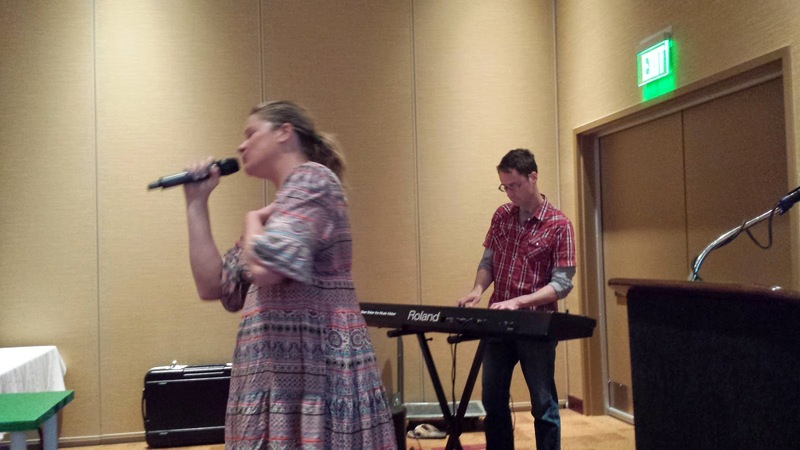 And here's Karen Irwin and Sean Baker, performing a Janis Joplin tune for the assembled. 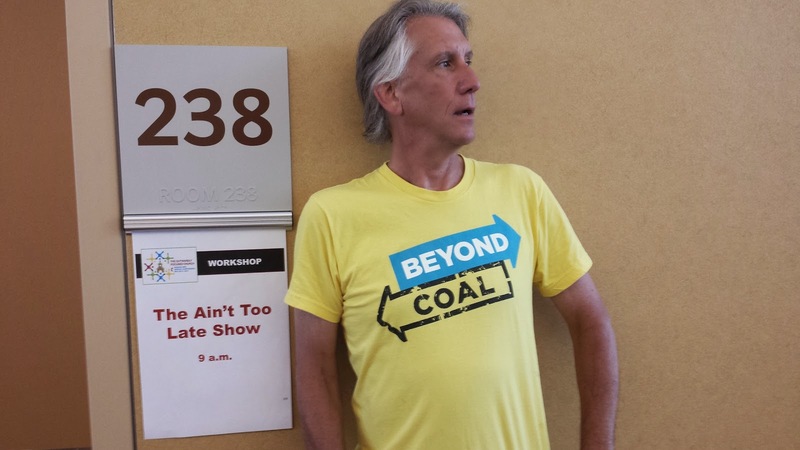 And here's me, sporting my Beyond Coal shirt. It was a wonderful experience, and we met so many powerful people of faith who are committed to stewardship of the planet. There's more to this week (hey, it's only Friday morning as I write this! ), but I will close with just one additional adventure. This first year of my work at Earth Charter Indiana, I visited three dozen schools or more. A handful of those schools — say around 10 or so — brought me back for multiple visits, and also showed up when I asked them to, such as at the Eco Science Fair at the Going Green Fest. That's the case with Promise Road Elementary in Noblesville. Last night, I attended their end-of-year PBL (Project Based Learning) celebration, that featured numerous projects, such as two Wounded Warrior Project displays and one featuring the work I helped them with: reducing their school's carbon footprint. This is an amazing school, replete with technology. This kids make videos about everything they do, create QR codes, then use twitter to spread the word and communicate with contacts — such as the twitter exchange they had with the Wounded Warrior Project. But they are getting their hands dirty, too. 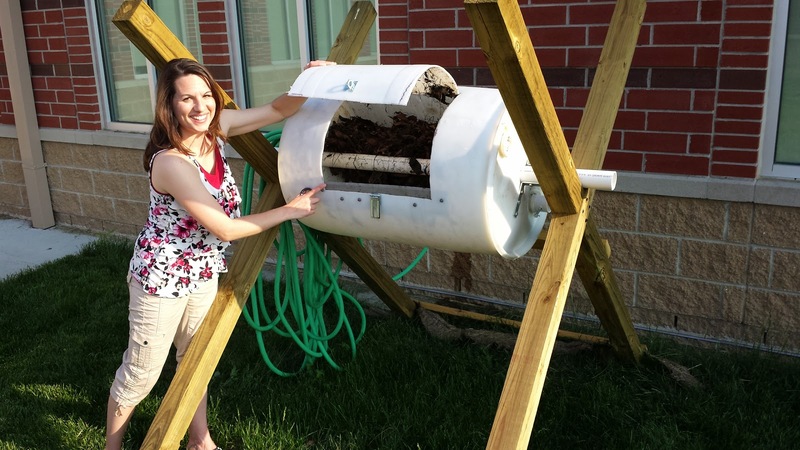 First grade teacher Nicole Powers showed me the composter they built that now sits next to the school. Nicole Powers, showing off the inside of the unit. It's huge -- and hugely wondrous! 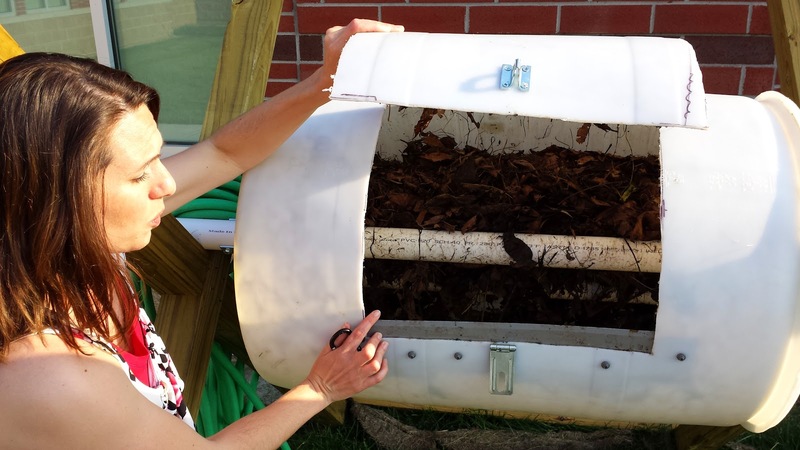 The story of this composter and of the adjacent garden the kids helped build can be accessed here. I guarantee it will make you smile, and you'll know why I am smiling almost all the time now.